A Revolutionary Approach for 4-year olds upwards!!! 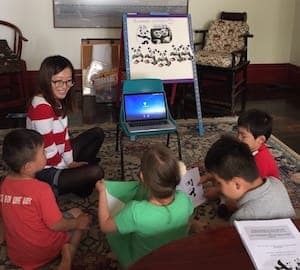 - to introduce the Chinese Mandarin language to the children in a fun and non-threatening classroom environment through the use of our Accelerated Learning technique. - to provide them with a solid foundation for learning Chinese Mandarin in future years (e.g. VCE Chinese) through teaching them the basics of the language (e.g. Pin Yin, Chinese script, tone marks, grammar) and conducting these classes in English (as opposed to a non-English speaking classroom environment) with less than 8 students per class. 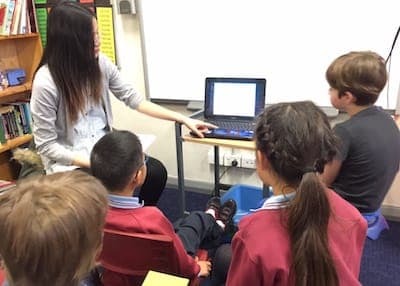 - to teach them effectively using a flexible and modularised structured syllabus which will let them use the Chinese language in everyday situations. - to ensure that the children will grow to love studying the Chinese Mandarin language by not overwhelming them with new information too fast and too soon. They will learn Chinese in a way which will let them retain the information more effortlessly and be able to use the language more confidently with a strong foundation. Since my child joined your classes, she actually now looks forward to Chinese classes! This is amazing especially since she is also practising with us at home now. The teaching theory of 'Accelerated Learning for Children' (ALC) is based both on Accelerated Learning techniques and Multisensory Instruction (Montessori, 1912). The term Multisensory refers to any learning activity that simultaneously inputs information using two or more sensory modalities, such as touching, hearing or seeing. Multisensory teaching links four parts of the language - listening, speaking, reading and writing together. In a typical class that implements Multisensory techniques the teacher uses both oral and visual details that need to be learnt so that the student's mind will be consistently exposed to the material. Jasmine is doing a terrific job with the class, they adore her, and are learning so much. 'Accelerated Learning for Children (ALC)' is specially designed for primary and secondary school students by Dr Moni Storz, formerly of Monash University. ALC teaching is children-centered and is based on the premise of effective learning rather than rote learning. Each class is designed as a 120-minute learning activity. There are 8 classes (one class per week) per Term and 4 Terms per year. In every class, there are many games, songs and role-plays. 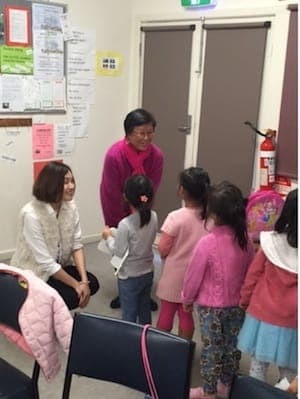 Children will learn listening, speaking, reading and writing skills in a fun and happy learning environment and experience a whole new different approach to learning Chinese. Most importantly, our children teachers have all been police checked and possess 'Working with Children' permits. Do check out our wonderful teachers who have all been trained in the use of Accelerated Learning techniques for teaching Chinese Mandarin in our classes. Just thought you might be interested to know about Aden's progress. He loves going to Chinese now and is thrilled to see his teacher. No more tears!!! We are very pleased with his progress as well. Thanks! Level 1: Read and write basic Chinese characters. Learn through songs, fun, songs, activities and role plays. Introduction to Pin Yin. Level 2: Continue with Pin Yin. Read and write more words. Conversation practices. Learn through fun, activities and role plays. I am so surprised at my daughters progress in Mandarin especially as we dont speak Mandarin at home. Grandma tries to speak Mandarin when she is with them but they wont answer her. They really enjoy the class. Its amazing to see that only after 1 term, they girls have progressed incredibly! Its so cute to hear when they try to teach their Aussie dad & friends what they know. Especially my youngest who is only 3yrs old and can now write some simple mandarin!!! Thank you for your help. Timetable of our public Children Classes in Melbourne. Profiles of our Children Teachers. 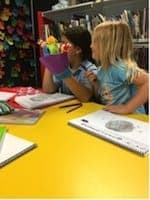 We also offer in-home classes in Melbourne, Sydney & Perth where these children classes are conducted privately for a group of parents who may have their children studying together because of a convenient time and/or location. Contact Olga for more information or for an Enrolment Form: olga@accschinese.com or on 0421 709 414. ..... the results are evident for my daughter who also attends. She is the only student in her school class achieving 99.9% in her exams, even above the Chinese background student who spoke Mandarin already! Ayana will be continuing next term. She got very disappointed when she realised it was the end of term because she thought she had to go back to ballet. When I told her she could keep doing Chinese, she was most excited.